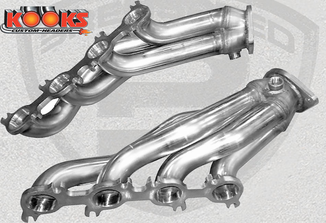 Kooks Headers and Exhaust have just released their brand new 2011-2013 Ford Mustang GT 5.0L Super Street Line of Headers. These headers are a huge improvement over stock and are the first in the new series of OEM Replacement headers being offered from Kooks! The primaries are 1 7/8” and the collectors are 3”. The flanges are 3/8” thick and are completely constructed from 304 Grade Stainless Steel. These headers are considerable lighter than the factory manifolds and will be the perfect upgrade while making loads of horsepower and torque. 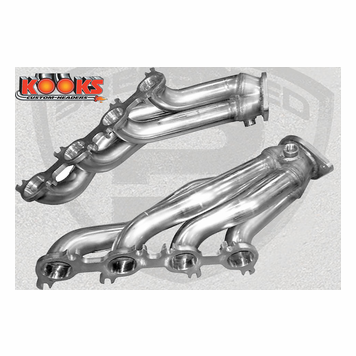 Designed to be a direct-fit with the factory catalysts, these headers will not require any cutting or welding and will not give any issues with the “Check Engine Light.” If you’re looking for an easy bolt-on upgrade that will produce horsepower, look no further…The Kooks Super Street Headers are for You! Package includes new gaskets and hardware.